Clinical Reasoning in Small Animal Practice presents a revolutionary approach to solving clinical problems. As a veterinarian, especially as a student or new graduate, a ten minute consultation in a busy small animal practice can be a daunting task. By guiding you to think pathophysiologically, this book will help solve clinical problems as efficiently as possible. The authors set out a structured approach with easy to remember rules which can be applied to most clinical signs small animals present with. This reduces the need to remember long lists of differentials and avoids the potential of getting trapped by a perceived obvious diagnosis. The book will help to unlock your potential to solve clinical problems. It also provides a logical rationale for choosing diagnostic tests or treatments which can be clearly communicated to the owner. Clinical inductive reasoning offers you the ability to solve cases more efficiently, resulting in better treatment and care for pets and happier owners. 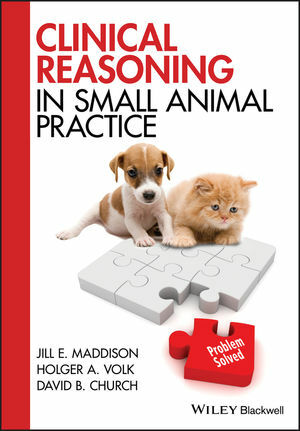 Clinical Reasoning in Small Animal Practice will help turn a terrifying case into a manageable one! Dr Jill E. Maddison BVSc, DipVetClinStud, PhD, FACVSc, MRCVS is Director of Professional Development, Extra Mural Studies and General Practice at The Royal Veterinary College, UK. Jill is actively involved in undergraduate teaching at the RVC in the areas of clinical problem solving and inductive clinical reasoning in small animal medicine and clinical pharmacology for veterinary students and nurses. She has published over 60 refereed papers in veterinary and medical journals and has been invited to speak at numerous international CPD meetings. In April 2012 she became the chair of the WSAVA Continuing Education (CE) Committee which facilitates CE for veterinarians in developing countries. Jill has been responsible for programming the clinical CPD streams at The London Vet Show since its launch in 2009. Professor Holger A. Volk DVM, PGCAP, DipECVN, PhD, FHEA, MRCVS is Clinical Director of the Small Animal Referral Hospital and Professor of Veterinary Neurology and Neurosurgery at the Royal Veterinary College, UK. He is a Recognised RCVS and European Specialist in Veterinary Neurology, and President of the European College of Veterinary Neurology from 2014-2016. He is fascinated by and involved in facilitating learning for any type or level of learners. He is a frequent speaker at national and international meetings, is section editor of multiple basic and clinical veterinary science journals and is widely published in scholarly journals. Professor David B. Church BVSc, PhD, MACVSc, FHEA, MRCVS is the Vice Principal for Learning and the Student Experience at The Royal Veterinary College, UK. He is the author of numerous scientific articles and book chapters and has an ongoing interest in relevant continuing education for practitioners and in particular the value of the problem-oriented approach to small animal medicine.